On Tuesday, February 5, St. Michael's recognized the women’s and men’s basketball seniors before their basketball games against Hyde Park at Carter Athletic Center. Amber McGee the only senior of the women’s team was honored before their game. The Lady Crusaders defeated Hyde Park 42-32 to keep their playoff hopes alive and move into a second place tie. 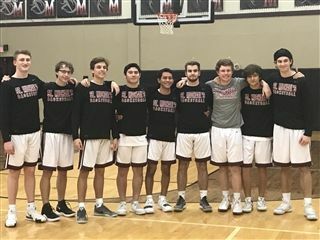 The men’s basketball team honored their nine seniors, Blaise Dehner, Niko Guiterrez, Jason Jehl, Paul Meyer, Will Prevost, MJ Samaniego, Nicholas Villarreal,Nathan Vondrak and Augie Watkins. The Crusaders defeated Hyde Park 56-47 to remain tied for first place in district and clinch a playoff berth. The Lady Crusaders and Crusaders will have their last game of the regular season this Friday at Brentwood Christian. The women tip off at 6:30 and men tip off at 8:00 p.m. Thank you seniors for all your hard work and dedication.